Tinytags used with a thermistor probe record data used to verify the temperature of a waterbath, to ensure levels are maintained within a set tolerance for corrosion testing of steels. Caparo Testing Technologies offers various metallurgical and non-destructive testing services to aerospace, oil and gas, and general engineering companies. 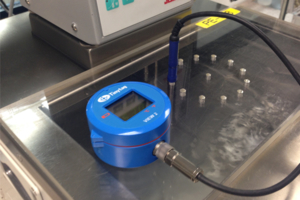 Caparo is using two Tinytag View 2 data loggers each with a thermistor probe to help prove that the temperature of a waterbath is maintained at the correct tolerance level for corrosion testing of steels. Recorded data is checked after a test period of 24/48 hours. If the waterbath has maintained the correct temperature within 2 degrees Celsius, no further action is taken. If any issues become apparent, the results are not reported and the waterbath is investigated. Lee Willison, Quality Engineer at Caparo, is responsible for carrying out auditing and quality support duties, and chose Tinytags for their accuracy, mobility and overall data logging capabilities. He comments, "I am very happy with the results, and the View 2 logger with its integral LED display is useful as it shows current readings as well as recording temperature data over the test period." Monitor temperature with a Tinytag View 2 data logger for use with a thermistor probe.